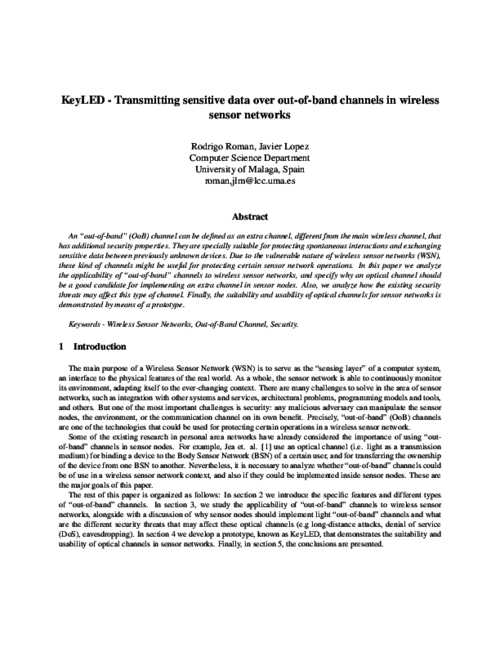 KeyLED - Transmitting Sensitive Data over out-of-band Channels in Wireless Sensor Networks | Network, Information and Computer Security Lab. An out-of-band (OoB) channel can be defined as an extra channel, different from the main wireless channel, that has additional security properties. They are specially suitable for protecting spontaneous interactions and exchanging sensitive data between previously unknown devices. Due to the vulnerable nature of wireless sensor networks (WSN), these kind of channels might be useful for protecting certain sensor network operations. In this paper we analyze the applicability of out-of-band channels to wireless sensor networks, and specify why an optical channel should be a good candidate for implementing an extra channel in sensor nodes. Also, we analyze how the existing security threats may affect this type of channel. Finally, the suitability and usability of optical channels for sensor networks is demonstrated by means of a prototype.